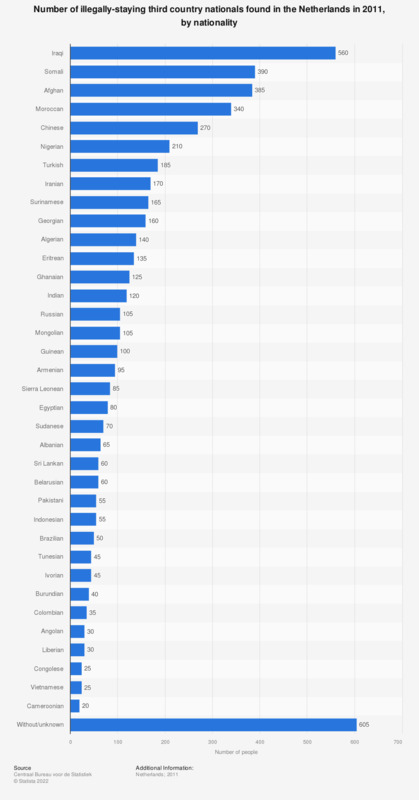 This statistic shows the total number of illegally-staying third-country nationals found in the Netherlands in 2011, by nationality. It reveals that the top five nationalities found to be staying illegally in the Netherlands were Iraqis (560), Somalis (390), Afghans (385), Moroccans (340) and Chinese (270). Third country nationals: nationals with an other nationality than one of the EU member states, Norway, Iceland, Liechtenstein or Switzerland. This also includes the stateless.